Located in the shadow of Sunday River, Mt. 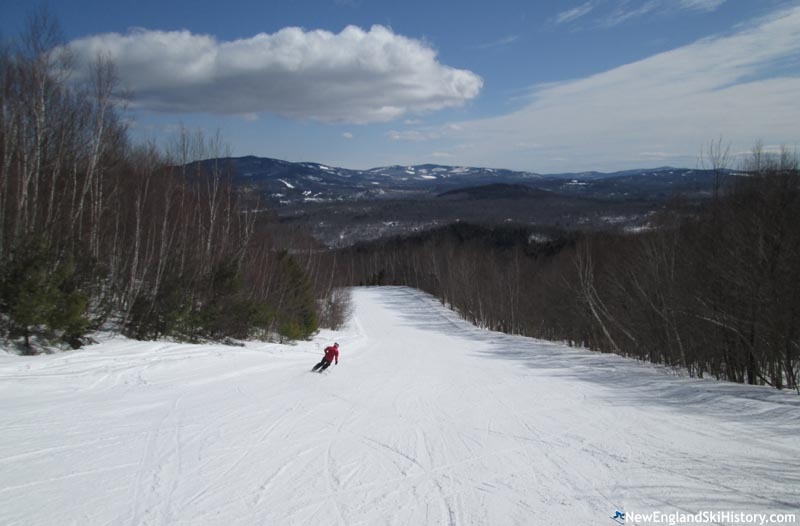 Abram features classic New England skiing. 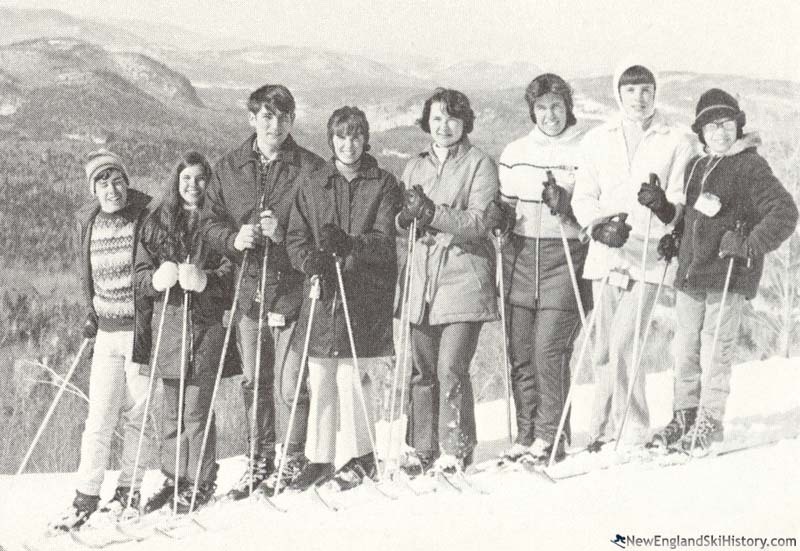 While Sunday River had been developed in the late 1950s, it was nowhere near the powerhouse it would become in the 1980s. As such, there was still room to start another ski area in the greater Bethel market. 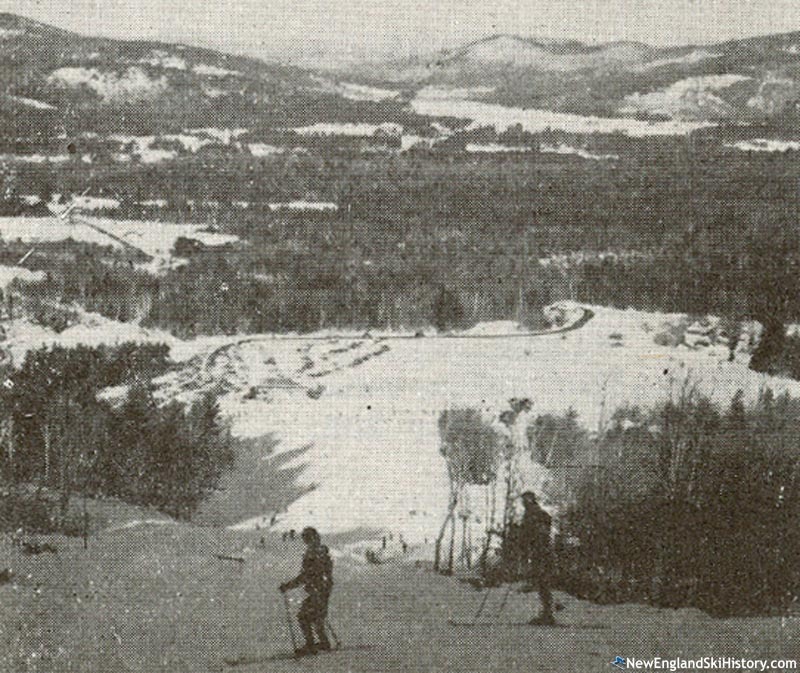 Locals logging brothers Norton, Stuart, and Donald Cross began developing a ski area on the northeastern slope of Mt. Abram in the spring of 1960. Two slopes were cleared for the debut season, served by a 1,000 foot T-Bar. In addition to skiing, skating and tobogganing were also offered. Mt. Abram opened on December 11, 1960 and was formally dedicated that Christmas Eve. For its sophomore season, Mt. Abram expanded to the upper mountain when it installed today's Maine T-Bar. The 3,350 foot lift served some 900 vertical feet with trails more than doubling in length. At this point, Mt. Abram was comparable to Sunday River's previous season facility size. Two years after Sunday River added its Mixing Bowl area, Mt. Abram responded by opening its own separate beginner area for the 1965-66 season. Serviced by a Hall T-Bar, the new complex featured a handful of gradual novice trails. Significant trail improvements took place for the 1966-67 season, as 25 cases of dynamite and 3,000 bales of hay were used to smooth terrain and improve conditions. Mt. Abram installed a new 4,121 foot long double chairlift for the first full season of the 1970s. The installation of the Way Back Machine meant that Mt. Abram had beaten Sunday River to the punch for being the first chairlift served ski facility in the region. Not only did it increase Mt. Abram's uphill capacity to 3,200 per hour, but it also increased its vertical drop from 900 to 1,030 feet, depending upon the publication. After experiencing some difficult seasons during the 1970s, the Cross brothers looked to get out of the ski business. The ski area was put up for sale starting in 1975. Looking to diversify Mt. Abram's offerings, the "American Zephyr" monorail was added for 1978. 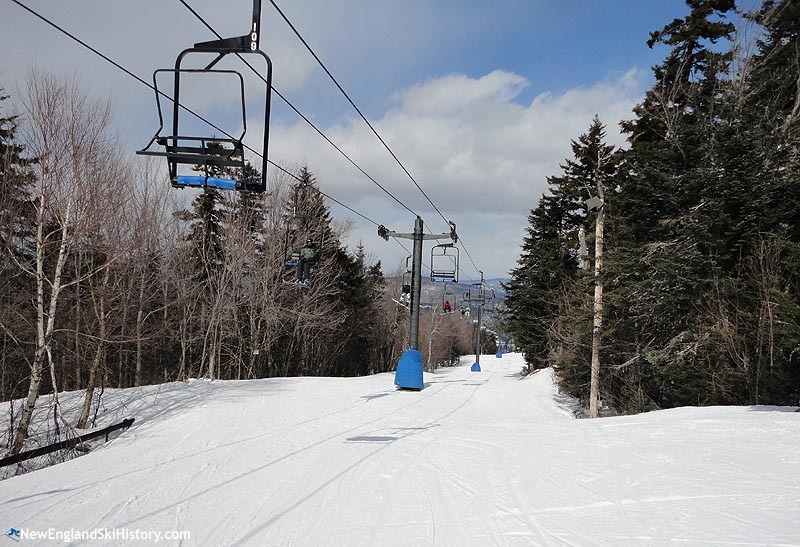 The first of its type in the East, the 5,300' ride was served by the summit double chairlift. The brothers' mom Gladys "Gram" Cross took the inaugural ride. A second, smaller monorail was added for the summer of 1979, apparently served by one of the T-Bars. The two rides operated from June until September. The monorail business was abandoned in the early 1980s. Following another tough winter, in which a helicopter was hired to haul snow onto the mountain, snowmaking was finally added for the 1985-86 season. The town of Greenwood helped to obtain financing for the project, in exchange for clay dug from the 2.5 million gallon pond (which was used to cap a dump). Five miles of pipe was installed, giving Mt. Abram top to bottom snowmaking. The West Side area was added for the 1988-89 season, served by Mt. Abram's second double chairlift. The new complex provided additional novice and intermediate terrain. Following three tough winters, the Oxford Bank and Trust foreclosed on Mt. Abram at the end of the 1992-93 season. That off season, Mt. Abram was sold at auction to Rick Hoddinott (principal owner; founder of Downeast Whitewater), Jeff Van Decker, Tom Kennison, Tim Good, and Pat Dutton. Three years later, the group built a new lodge at the base of the West Side area, as well as expanding offerings to include snow tubing. Following a tough 1997-98 season, Norway Savings Bank foreclosed on Mt. Abram. Randy Duncan, owner of Steamboat Navigation, R.D. 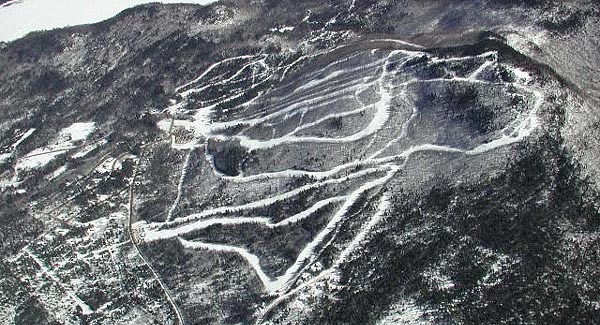 Outfitters, and Schooner Investment Co., purchased the ski area and adjacent property for $577,500 at a August 7, 1998 auction. Camden National Bank foreclosed on the Duncans in 2000, resulting once again in an auction. On November 25, 2000, when Josh and Susan Burns purchased the area for $325,000. The Duncans subsequently sued the bank for its handling of their loans. On September 24, 2004, a jury awarded the Duncans $1.5 million in damages. After eight years of ownership, the Burns sold Mt. Abram to Matt Hancock and Rob Lally in the spring of 2008. The main lodge suffered heavy fire damage on July 6, 2011, after lightning struck it. A temporary building was constructed in time for the 2011-2012 season. Energy efficiency was also addressed that year, as new snow guns were purchased and wood pellet boilers installed. In the fall of 2013, Mt. Abram announced Mountain Rider's Alliance was hired to run the ski area. Plans were being made to potentially convert Mt. Abram to a co-op ownership model. In the fall of 2014, Mt. Abram unveiled a 245 kilowatt solar farm, installed adjacent to the main parking lot. "I grew up on that mountain and my dad lived in the Mt. Abram Village. I started skiing At the age of 5 and eventually taught skiing there myself with my dad. There are so many great memories on that mountain!! I will always love that place. I hope it still stays open for many many years to come! " "We were raised on the mountain. My sons had lockers in the lodge and got off the bus in the parking lot each day after school, skied for a couple hrs, then walked home. What great memories. " "So many fond memories at Mt. Abram. Back in 1992/93 my father, Rick Hoddinott, bought Mt Abram at a auction. Over the years he made some wonderful changes, his main goal was for Mt Abram to be the most family oriented ski resort around. I remember the building of the West Side Lodge & several log cabins for renting ...the amazing tubing park being put in (where I had my 10th Birthday! )...the Women's Pro Ski Tour.., Hoddinott was also was the first to put in night skiing at the Mountain. Unfortunately after the Ice Storm of 98' irreversible damages had been done to the majority of ski lifts & equipment and the Mt was foreclosed on soon after. Mt Abram has always had a special place in my heart & always will thanks to all the wonderful memories that were made there over the years. ❤️ ~Avery Hoddinott"
"I try to make a winter trip back to Maine each year. Being in PA now, I've skied the Poconos and NY mountains. But hitting the slopes at Mt. Abram is like coming home again and is my favorite, hands down." "My families legacy. I grew up skiing there." "so many wonderful memories there. Ski Patrol classes with Blaine Mills, Gary Fuller and many more. Ski instructor,Gerry Smith helped me when competing for Gould Academy. Started skiing there from opening day. remember the dances in high school. " "So many memories! And fresh donuts by Grampa Young every morning." "I was on the ski patrol, then the ski school, and later was the race-program director for 15 years. One couldn't ask for a better place to ski, nor better skiers with whom to share experiences." "WAY TOO MANY MEMORIES TO LIST!!! SOME OF THE BEST YEARS OF MY LIFE!"